one of the most exciting I’ve seen in years." Robert Epstein is passionate about advancing the behavioral sciences and helping people flourish. Scroll down to learn about his recent projects, or click left for specific topics. To learn about his recent research on the Search Suggestion Effect (SSE), the Search Engine Manipulation Effect (SEME), and other new types of online influence, click here. 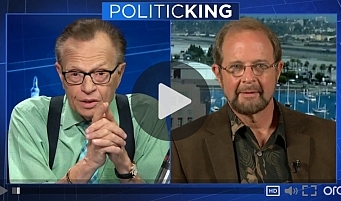 To see Larry King's interview with him about SEME, click the image. To follow Dr. Epstein on Twitter, click here: @DrREpstein. Dr. Epstein's online psychological tests are now taken by more than a million people per year. To check out the tests, click here. Do you need therapy? The Epstein Mental Health Inventory has been updated to be consistent with the DSM-5, the current official diagnostic manual of the American Psychiatric Association. The new version is also jargon free and easy to read and understand. To see if you might benefit by meeting with a mental health professional, visit http://DoYouNeedTherapy.com. To read "How Science Can Help You Fall in Love," Dr. Epstein's cover story in Scientific American Mind, click here. To read a commentary on Dr. Epstein's work on love in the Washington Post, click here. ciety. All of America should take note of it." Parent of a teen or preteen? The Epstein Teen Parenting Inventory is now accessible at TeenParentingSkills.com. To learn about TEEN 2.0: Saving Our Children and Families from the Torment of Adolescence (an updated, expanded version of The Case Against Adolescence, which was cited by the U.S. Supreme Court in 2010), click here. To read about National Youth Rights Day, click here. To view Dr. Epstein's Young Person's Bill of Rights, click here. To hear an interview with Dr. Epstein about Teen 2.0 on Minnesota Public Radio, click here. TEEN 2.0: Saving Our Children and Families from the Torment of Adolescence, was praised by renowned therapist Albert Ellis as "one of the most revolutionary books I have ever read," by Newt Gingrich as "a must read," by Joyce Brothers as "profoundly important," by Deepak Chopra as "rigorous and persuasive," by Alvin Toffler as "an essential read," and by Drew Pinsky as a "landmark book." Click here to download an interview from Psychology Today magazine about an earlier version of the book. Click here to take the Epstein-Dumas Test of Adultness. If you are a media professional or parent, click here to download a set of questions and answers about the book. remarkable insight into the creative process." From a cover story in Scientific American Mind, click here to read about Dr. Epstein's landmark research on how to "Unleash Your Creativity." And check out the video of Dr. Epstein talking about how to boost creativity in business on "The Big Idea with Donny Deutsch" on CNBC here. Need a creativity boost? To take the Epstein Creativity Competency Inventory for Individuals, visit MyCreativitySkills.com. To download a free copy of Dr. Epstein's e-booklet, Creativity for Crises: Ten Tweaks for Tough Times, click here. Want to know how you measure up as a parent? Take the new Epstein Parenting Competencies Inventory: the first comprehensive test of skills that are important for raising happy, healthy, productive children. Go to MyParentingSkills.com. Concerned about your mental health? Take the Epstein Mental Health Inventory: a comprehensive 5-minute mental-health screening test based on the newly revised diagnostic manual used by therapists. Go to DoYouNeedTherapy.com. especially when it comes to teenagers." To see how strong your relationship skills are in seven different categories, go to MyLoveSkills.com. To take the Epstein Sexual Orientation Inventory, visit MySexualOrientation.com, available in English, French, Spanish, German, Dutch, Japanese, and Hungarian. love from scratch in a new relationship. marriages can benefit us all." Janice R. Levine, Ph.D., Why Do Fools Fall in Love? Feeling stressed? Take the latest version of the Epstein Stress Management Inventory for Individuals. Go to MyStressManagementSkills.com. his ideas with passion and power." Is your motivation sagging? Take the latest version of the Epstein Motivation Competency Inventory for Individuals. Go to MyMotivationSkills.com.